A timeless, terrifying tale of one man's obsession to create life—and the monster that became his legacy. Enriched Classics offer readers affordable editions of great works of literature enhanced by helpful notes and insightful commentary. The scholarship provided in Enriched Classics enables readers to appreciate, understand, and enjoy the world’s finest books to their full potential. Mary Shelley (1797-1851) was born to well-known parents: author and feminist Mary Wollstonecraft and philosopher William Godwin.Unfortunately, Wollstonecraft died as the result of Mary's birth. Mary was raised by her father and a much resented stepmother. When Mary was sixteen, she met the young poet Percy Bysshe Shelley, a devotee of her father's teachings. In 1816, the two of them travelled to Geneva to stay with Lord Byron. One evening, while they shared ghost stories, Lord Byron proposed that they each write a ghost story of their own. 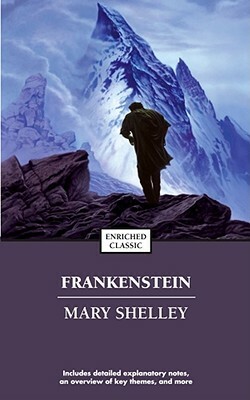 Frankenstein was Shelley’s contribution. Other works include Mathilda, The Last Man, and The Fortunes of Perkin Warbeck. Mary Wollstonecraft Shelley died in 1851 at the age of fifty-three.